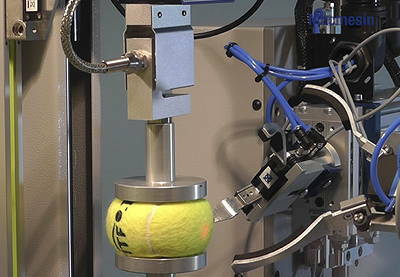 The ITF has taken delivery of a machine that allows it to test tennis balls automatically. Ball manufacturers are required to submit samples of their products to the ITF for testing and approval, in accordance with the official Rules of Tennis, to ensure that they perform consistently during tennis tournaments. The machine (above) tests a variety of parameters on three axes to check whether the balls meet international standards. It had to be able to accommodate both standard tennis balls and the larger, slower foam balls used by beginners. It also needed to load and unload the tennis balls reliably and automatically, and to grip and rotate them during testing. The ITF also wanted to be able to monitor the machine remotely, thus allowing its staff to carry on with other tasks while testing was underway. Another requirement was that the machine should be able to adapt to new tests in the future, without needing to be re-designed. The ITF called in Mecmesin, a UK-based designer and builder of force and torque measurement systems, to design the ball-testing machine. 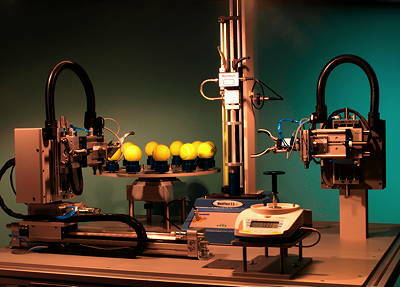 With the ITF’s previous ball-testing system, the balls were loaded onto the machine automatically, and the test was set to run. However, if a ball became misaligned during the test, the process had to be halted until a technician returned later in the day. The test would then need to be restarted and a technician would need to stay with the machine to load the balls by hand. “By using an automated sample-handling system, testing is now more reproducible and does not require constant attendance from technicians, who are free to perform other duties,” says Mecmesin automation engineer, Simon Garland. “The automated system can safely be left unattended to perform all of the required tests, and on completion, a comprehensive test report is available with a graphical display of the test results.” If there are any problems, the technicians can be alerted in real time. The system is driven by Mecmesin’s Emperor software which allows users to choose which tests are to be made from a menu. To ensure consistent match performance, the balls are compressed to a specified load (as shown above), and the amount of movement measured. This is called “forward deformation”. The load is then released and the “return deformation” is also measured. To make sure each ball behaves uniformly, pneumatic grippers (shown below) rotate the ball, and the test is repeated on three perpendicular axes. The machine also records the diameter of each ball and its weight.